With this anthology, Barbara Hughes Fowler presents the most comprehensive selection of Greek poetry of the seventh and sixth centuries B.C. ever published in English. 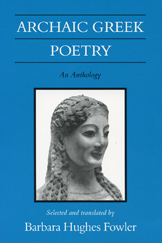 Fowler’s brilliant translations provide access to six Homeric Hymns, eight selections from Bakchylides, twelve odes of Pindar, selections from the iambicists and elegists, virtually all of Archilochos and of the surviving lyricists, including Sappho, and a number of anonymous poems about work, play, and politics. Archaic poets delighted in all that was radiant and delicate, and their poems should be read for their narrative charm, celebration of nature, and playful sensuality. There are tantalizing fragments of fables here, as well as poems of friendship and warfare, love and colonization. Along with her notes and bibliography, Fowler has provided a biographical list of poets and a glossary of proper names. In addition to its breadth, Archaic Greek Poetry stands alone as the only volume of its kind translated by a contemporary published poet. Perhaps the most elegant translator of ancient Greek poetry into modern English, Barbara Hughes Fowler offers translations true to the original Greek while providing modern readers with superb examples of the beauty of lyric poetry. Students and scholars of classical and comparative literature, ancient history, and art history, as well as lovers of lyric poetry, will enthusiastically welcome this volume. Barbara Hughes Fowler is John Bascom Professor of Classics Emeritus at the University of Wisconsin–Madison. She is the author of The Hellenistic Aesthetic and Hellenistic Poetry, both published by the University of Wisconsin Press. She is also the author of The Seeds Inside a Green Pepper, a volume of her own poetry. The 1992 cloth edition of this book is out of print, but the paperback is still available.